Many of us have fears about swimming. The deep end can be a scary place until it isn’t anymore. What if you lived by the sea and your whole family swam daily in the deep water? What if you were the youngest and even though not much scared you (not the classics like snakes, spiders or the dark), you were afraid to swim in that beautiful greeny-blue water? Even though you longed to? 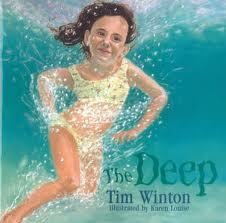 This is what Alice deals with in Tim Winton‘s The Deep (illustrated by Karen Louise). She hated being small. Being stuck in the shallows. She could swim, couldn’t she? So why couldn’t she swim in the deep? This book would be particularly helpful for children dealing with their fear of learning to swim. This entry was posted in Uncategorized and tagged courage, fiction, great read alouds, making connections, picture books, Tim Winton by carriegelson. Bookmark the permalink.